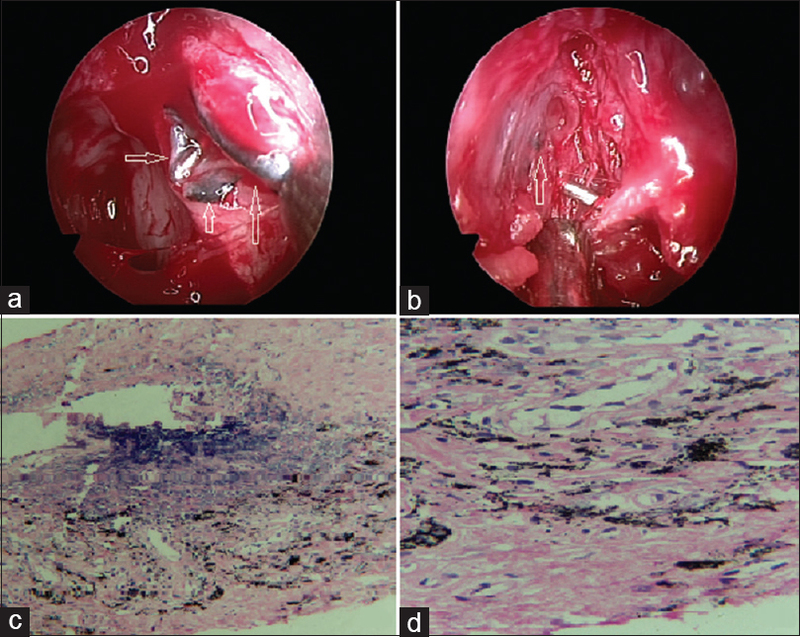 A 62-year-old woman underwent bilateral endoscopic dacryocystorhinostomy with canalicular trephination for epiphora. Intraoperatively, abnormal pigmentation was noted around the common canalicular opening into the lacrimal sac [Figure 1]a and [Figure 1]b. The histopathology showed fibrous tissue with abundant pigmentation within the cytoplasm of stroma of the fibrous tissue [Figure 1]c and [Figure 1]d. Appearances of these pigments were consistent with mascara. The physical findings combined with a high index of suspicion, especially in cases of heavy mascara use, may allow for an accurate diagnosis. Ciolino JB, Mills DM, Meyer DR. Ocular manifestations of long-term mascara use. Ophthalmic Plast Reconstr Surg 2009;25:339-41. Clifford L, Jeffrey M, Maclean H. Lacrimal sac pigmentation due to mascara. Eye (Lond) 2011;25:397-8. Hidayat A, Weatherhead R, Al-Rajhi A, Johnson F. Conjunctival and lacrimal sac pigmentation by kohl (eyeliner). Br J Ophthalmol 1997;81:415.